NOTE: This course satisfies the statutory requirement of one contact hour being in education programs or topics concerning prescription opioid drugs, including the risks and signs of opioid abuse, addiction, and diversion. This is pursuant to P.L. 2017, c. 341 for both LPCs 2[12.] 11.2 and LCSWs 2[11.] 10.2. 1.Workshop participants will be able to differentiate the major elements the Federal Government uses when classifying drugs from schedule 1 through schedule 5. 2.Workshop participants will be able to identify three different energy drinks w/alcohol & their side effects. 3.Workshop participants will be able to identify at least two differences (in terms of negative effects) that occur with the ingestion of synthetic cannabinoids. 4.Workshop participants will be able to identify which class of drugs synthetic cannabinoids & bath salts (synthetic cathinones) are classified under in the current version of the Diagnostic and Statistical Manual of Mental Disorders. Workshop participants will be able to list at least three negative side effects of each. 5.Workshop participants will be able to differentiate differences that drugs of abuse such as Adderall, Oxycodone and Suboxone are classified under in the current version of the Diagnostic and Statistical Manual of Mental Disorders. Workshop participants will be able to list three negative side effects of each drug listed in this lecture. 6.Workshop participants will be able to list and describe two different best practice therapy approaches regarding counseling clients who are abusing these emerging substances of abuse. 7.Workshop participants will be able to verbalize current legal issues both locally and nationally as they relate to using these emerging substances of abuse. 8.Workshop participants will be able to list and identify three street names and at least one route of administration of the research chemicals covered in this lecture. Workshop hours: 9 a.m. – 3:30 p.m. This course is approved for 5 NBCC Clock Hours (LPC, LAC, LCADC, CADC, LMFT) of continuing education (NBCC Provider #6532). This course is approved by the Association of Social Work Boards – ASWB NJ CE Course Approval Program Provider #87 Course #2170 from 11/16/2018 to 11/16/2020. Social workers will receive the following type and number of credit(s): Clinical Practice 5. 1. Overview of the scheduling of controlled substances. 1. History of classifying/prohibiting marijuana. 2. Synthetic vs. naturally occurring cannabinoids. 3. What are synthetic cannabinoids and the history of their rise in popularity. 4. Classes of synthetic cannabinoids. 6. Generational iterations of synthetic cannabinoids. 7. Legal Status both locally and nationally. 1. What are “bath salts” and the history of their rise in popularity. 2. Synthetic amphetamines with hallucinogenic properties. 3. Dangers/lethality/Poison Control Center data. 4. Timeline, effects of use and relation to Ecstasy. 5. Legal status in New Jersey, Pennsylvania and nationally. 1. History of classifying/prohibiting opiates. 2. Opiates (Opium, Kratom) and synthetic opioids (Heroin, Oxycodone, Oxycontin). 3. Medicated assisted treatment for opiate addiction (Methodone, Suboxone, Vivitrol). ABOUT THE PRESENTER: Glenn Duncan LPC, LCADC, CCS, ACS has been working in the behavioral healthcare field for twenty six years. He has lectured nationally on many topics including clinical supervision. He is a Licensed Professional Counselor, a Licensed Clinical Alcohol/Drug Counselor, a Certified Clinical Supervisor, and an Approved Clinical Supervisor. Glenn is currently the owner of Advanced Counselor Training, LLC. For 15 years (2003-2018) Glenn served as the Executive Director at Hunterdon Drug Awareness Program, Inc. Responsibilities included the fiscal turnaround of Hunterdon Drug Awareness Program, from an organization heading for bankruptcy and being over $100,000 in debt to being the premier regional outpatient treatment facility staffed with the highest quality clinical, prevention and administrative staff. When Glenn retired from this organization on 08/31/18, the organization had $300,000 in operating reserve and was as clinically and fiscally stable as it ever had been since its inception in 1977. Glenn is a national expert on emerging drugs of abuse and emerging trends with existing drugs. He has consulted both locally in New Jersey and nationally with authorities on both the State and Federal levels. His presentations on emerging drugs of abuse have been used by officials in Illinois, Delaware, New Hampshire, and has been used by DEA officials for training purposes. Glenn presented on emerging drugs of abuse at the National Conference on Addiction Disorders in Orlando, Florida, the Governor’s Council on Alcohol and Drug Abuse in New Jersey, Rutgers University as well as privately with his own organization. As an extension to Glenn’s research in this area, he has developed a focused one-day workshop on issues surrounding medical and legal marijuana; topics which includes a historical perspective, policy and employment issues, many practice related issues and a ‘Dr Seuss’ perspective on this issue. 1) Is this course approved for LCSWs, LSWs, LPCs, LACs, LCADCs, CADCs and/or LFMTs? This course is approved by the Association of Social Work Boards – ASWB NJ CE Course Approval Program Provider #87 Course #2170 from 11/16/2018 to 11/16/2020. Social workers will receive the following type and number of credit(s): Clinical Practice 5. This course is an NBCC approved course which is good for LPCs, LACs, LCADCs, CADCs, and LMFTs. 2) I see on your website/brochure the following: “This course satisfies the statutory requirement of one contact hour being in education programs or topics concerning prescription opioid drugs”, is that something new as I have never heard of that requirement? 2[11.] 10.2 (New Section) The State Board of Social Work Examiners shall require that the number of credits of continuing education required of each person licensed or certified by the board as a condition of renewal include at least one credit of educational programs or topics concerning prescription opioid drugs, including the risks and signs of opioid abuse, addiction, and diversion. 2[12.] 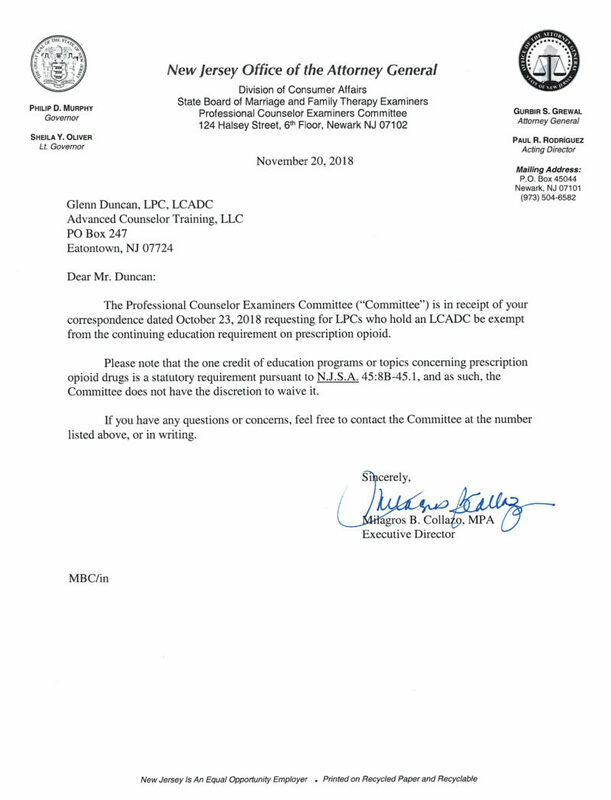 11.2 (New Section) The Professional Counselor Examiners Committee shall require that the number of credits of continuing education required of each person licensed by the board as a condition of renewal include at least one credit of educational programs or topics concerning prescription opioid drugs, including the risks and signs of opioid abuse, addiction, and diversion. 3) Is this new requirement (P.L. 2017, c. 341) just for LPCs and LCSWs? No! It is also a requirement for Licensed Psychologists (LPs) and Licensed Marriage and Family Therapists (LMFTs). Those regulations are listed on that same website above the LPC and LCSW sections. Only LCADCs/CADCs do not have this requirement. 4) Will this workshop only be held in Tinton Falls? Currently, we are holding this in central NJ to allow as many people as possible to have access to this workshop. 5) I have both my LPC and LCADC. Since the LCADC does not have this requirement, do I still have to take the 1 hour of opioid training every 2 years?